It was a stunning discovery: the first unlooted imperial tomb of the Wari, the ancient civilization that built South America's earliest empire between 700 and 1000 A.D. Yet it wasn't happiness that Milosz Giersz felt when he first glimpsed gold in the dim recesses of the burial chamber in northern Peru. 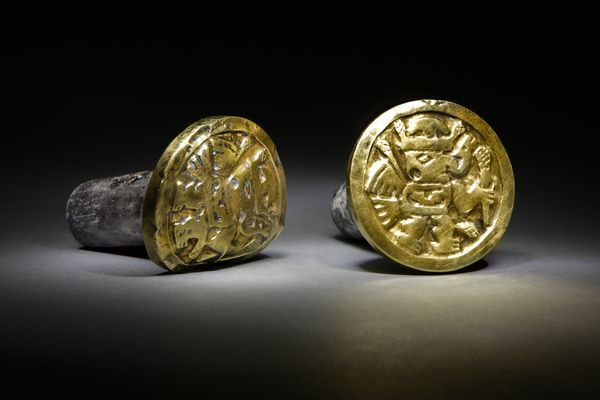 Giersz, an archaeologist at the University of Warsaw in Poland, realized at once that if word leaked out that his Polish-Peruvian team had discovered a 1,200-year-old "temple of the dead" filled with precious gold and silver artifacts, looters would descend on the site in droves. "I had a nightmare about the possibility," says Giersz. So Giersz and project co-director Roberto Pimentel Nita kept their discovery secret. Digging quietly for months in one of the burial chambers, the archaeologists collected more than a thousand artifacts, including sophisticated gold and silver jewelry, bronze axes, and gold tools, along with the bodies of three Wari queens and 60 other individuals, some of whom were probably human sacrifices. Peru's Minister of Culture and other dignitaries will officially announce the discovery today at a press conference at the site. 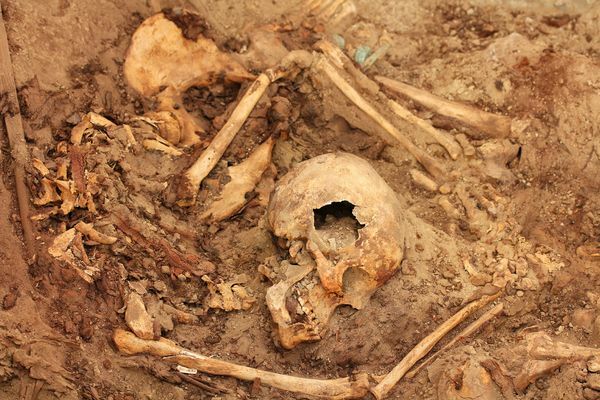 Krzysztof Makowski Hanula, an archaeologist at the Pontifical Catholic University of Peru in Lima and the project's scientific adviser, said the newly unearthed temple of the dead "is like a pantheon, like a mausoleum of all the Wari nobility in the region." The Wari lords have long been overshadowed by the later Inca, whose achievements were extensively documented by their Spanish conquerors. But in the 8th and 9th centuries A.D., the Wari built an empire that spanned much of present-day Peru. Their Andean capital, Huari, became one of the world's great cities. At its zenith, Huari boasted a population conservatively estimated at about 40,000 people. Paris, by comparison, had just 25,000 residents at the time. Just how the Wari forged this empire, whether by conquest or persuasion, is a long-standing archaeological mystery. The sheer sophistication of Wari artwork has long attracted looters, who have ransacked the remains of imperial palaces and shrines. Unable to stop the destruction of vital archaeological information, researchers were left with many more questions than answers. The spectacular new finds at El Castillo de Huarmey, a four-hour drive north of Lima, will go a long way toward answering some of those questions. Although grave robbers have been digging at the 110-acre site off and on for decades, Giersz suspected that a mausoleum remained hidden deep underground. In January 2010, he and a small team scrutinized the area using aerial photography and geophysical imaging equipment. On a ridge between two large adobe-brick pyramids, they spotted the faint outline of what appeared to be a subterranean mausoleum. The research at El Castillo de Huarmey is supported by National Geographic's Global Exploration Fund and Expeditions Council. Tomb robbers had long dumped rubble on the ridge. Digging through the rubble last September, Giersz and his team uncovered an ancient ceremonial room with a stone throne. Below this lay a large mysterious chamber sealed with 30 tons of loose stone fill. Giersz decided to keep digging. Inside the fill was a huge carved wooden mace. "It was a tomb marker," says Giersz, "and we knew then that we had the main mausoleum." 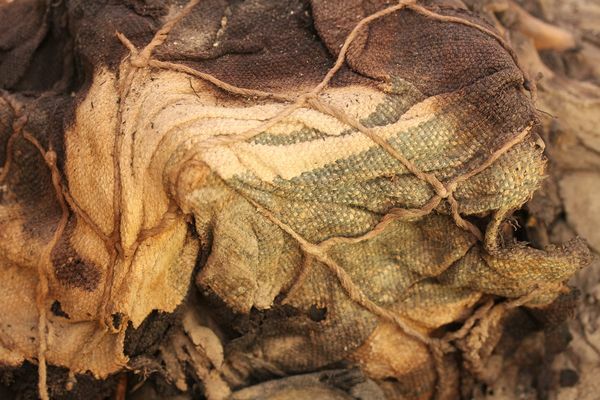 As the archaeologists carefully removed the fill, they discovered rows of human bodies buried in a seated position and wrapped in poorly preserved textiles. Nearby, in three small side chambers, were the remains of three Wari queens and many of their prized possessions, including weaving tools made of gold. "So what were these first ladies doing at the imperial court? They were weaving cloth with gold instruments," says Makowski. Mourners had also interred many other treasures in the room: inlaid gold and silver ear-ornaments, silver bowls, bronze ritual axes, a rare alabaster drinking cup, knives, coca leaf containers, brilliantly painted ceramics from many parts of the Andean world, and other precious objects. Giersz and his colleagues had never seen anything like it before. 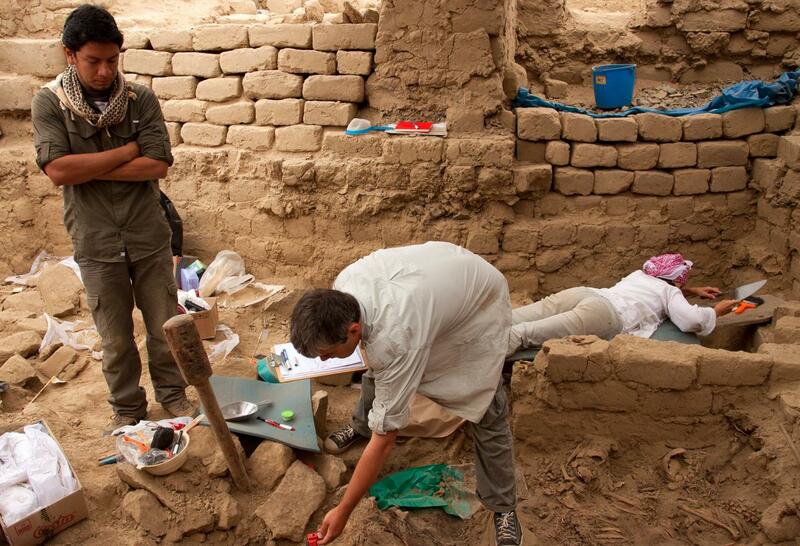 "We are talking about the first unearthed royal imperial tomb," says Giersz. But for archaeologists, the greatest treasure will be the tomb's wealth of new information on the Wari Empire. The construction of an imperial mausoleum at El Castillo shows that Wari lords conquered and politically controlled this part of the northern coast, and likely played a key role in the downfall of the northern Moche kingdom. Intriguingly, one vessel from the mausoleum depicts coastal warriors battling axe-wielding Wari invaders. The Wari also waged a battle for the hearts and minds of their new vassals. In addition to military might, they fostered a cult of royal ancestor worship. The bodies of the entombed queens bore traces of insect pupae, revealing that attendants had taken them out of the funerary chamber and exposed them to the air. This strongly suggests that the Wari displayed the mummies of their queens on the throne of the ceremonial room, allowing the living to venerate the royal dead. Analysis of the mausoleum-and other chambers that may still be buried-is only beginning. Giersz predicts that his team has another eight to ten years of work there. But already the finds at El Castillo promise to cast the Wari civilization in a brilliant new light. "The Wari phenomenon can be compared to the empire of Alexander the Great," says Makowski. "It's a brief historical phenomenon, but with great consequence."